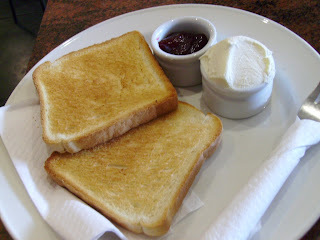 My waking thought had been of spreading something sweet onto toast. It was closely followed by the happy realisation that that waking dream could come true by popping into Tasos en route to the grocery shop at Psarakos. Jams are usually made from pulp and juice of one fruit, rather than a combination of several fruits. Berries and other small fruits are most frequently used, though larger fruits such as apricots, peaches, or plums cut into small pieces or crushed are also used for jams. Good jam has a soft even consistency without distinct pieces of fruit, a bright color, a good fruit flavor and a semi-jellied texture that is easy to spread but has no free liquid. And that sounds exactly like what I was eating. It's a low-tech breakfast, but a satisfying one. You can control the sweetness by loading up on jam, or moderate by favouring the more subtle marscarpone. You can keep it light with a smattering of each, or heap on the creamy cheese.